Following on from our previous post which outlined how UK disabled access still leaves a lot to be desired, it has come to light how much certain disab led persons, specifically wheelchair users, are actually struggling in the UK. Whilst less than 8% of disabled persons require the use of a wheelchair, there are approximately 1.2 million wheelchair users across the UK as a whole, so you would imagine that the country would be well provisioned for such people. Sadly, such an assumption would not be entirely correct. Despite the relatively commonplace nature of wheelchair users, some areas still make life exceptionally difficult for these individuals. Recently, the BBC News website has related how disabled passengers will no longer be able to benefit from taxi services in Teesside. Whilst the considerations that have led to this ruling, such as the cost of minibus facilities, are very real, the fact remains that neglecting wheelchair taxi services is morally wrong on many levels, and this story is far from the only wheelchair related news to be evident acr oss the country. Several charities that deal with wheelchair and mobility scooter hire are also finding themselves facing closure due to a lack of funding, and one could certainly be forgiven for finding most of the news stories detailing wheelchair concerns to be predominantly negative in nature. Here at Axess2, we strongly believe that wheelchair users, or any other person with impaired mobility, should be afforded the same level of treatment as any other person, and that’s why we are committed to providing a variety of wheelchair lifts for clients across the UK. 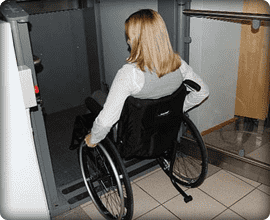 Our purpose built wheelchair and disability lifts allow any disabled person to move about their environment with the degree of freedom that they deserve, and many of our other lifts also incorporate such considerations too. 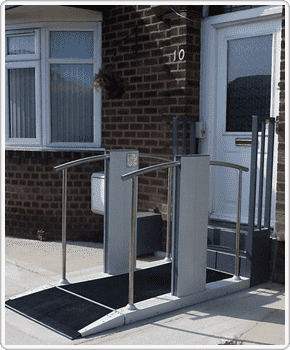 Our lifts for stairs, particularly our ‘Steppa’ variety, allow many wheelchair users to circumnavigate difficult obstacles like steps, so whether your property is commercial or residential it need not be anything other than totally ‘wheelchair friendly’. UK disability access might be mixed at best, but here at Axess2 we are determined to change that fact for the better. For more information, please get in touch with us now and we’ll be pleased to assist however we can.